When it's mid-July and the next holiday is not until after the summer, it pays to at least reminisce about the beach. About the endless blue skies and seas. About the strenuous bed-breakfast-beach-book-lunch-beach-book-dinner-bed routine. About wine on the bungalow porch at sunset. About the shiny and dull metallic blue of a shell. About rich sweet fish sauce-infused pork ribs. About a turmeric stained pickle. About salty broth with okra. About tangled pleasantly chewy squid tentacles. 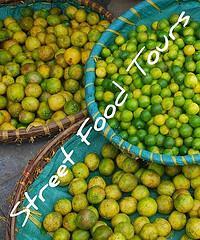 About the salty-sweet-sour-spicy nuoc cham. About eating real Vietnamese lunches. 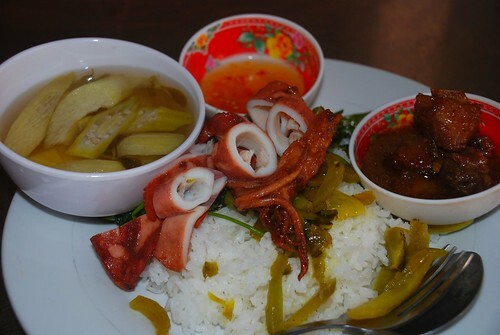 The squid in Phu Quoc is THE BEST!! I've had none tenderer. A quick note...I've followed your blog for some time and wanted to let you know that I enjoy and appreciate your gastronomic jottings. Well done! Keep it up, there's a book there somewhere. Gastronomer - I think we ate it everyday of our stay and I think on some days as part of every meal! I discovered this blog from a Asian grocery store web site. I should be working, but I can't stop reading it! I LOVE vicarious adventures! Your writing is so amusing and the food sounds really good. Don't stop!